Siemens Telefunken V72 Microphone Preamp Modules w/ Direct Inputs 220V #25772. BRAND - Siemens / Telefunken. FUNCTION - Tube Pre Amp. 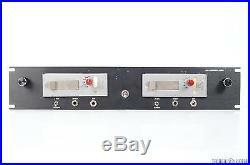 DESCRIPTION - This listing is for 2 Siemens / Telefunken V72 Microphone Preamp/ DI Modules in Rackmount. The units work on 220V. ACCESSORIES - The modules come wired into a rack mount face plate by Dan Alexander Audio with polarity switches, volume controls, XLR pigtails, heavy duty Step-up/Stepdown power transformer and 1/4 direct inputs. Otherwise, it comes only as seen in photos and does not include any other accessories. Note that the Step-up transformer that is included has a European style plug on it and will need an adapter to make it compatible with US sockets. PHYSICAL CONDITION - Very Good. Has some blemishes, normal wear, the right module front is a little bent, but they look very good overall, especially considering the age. WORKING CONDITION - Very Good. Both of these modules work great and sound incredible. For this listing we had both units sent to David Kulka of Studio Electronics to be serviced and re-capped. Both are in optimum working condition and should provide years of excellent service! We offer a 100% satisfaction guarantee. Techno Empire reserves the right to. We do our best to test each piece of gear and describe it as accurately as possible before listing it. We take lots of detailed photos so that you can make the fairest evaluation of the item's physical condition using your own skilled observation, independent of our techs qualified, yet subjective, opinion. We strongly suggest that you check your order after receiving it to be sure that it is in proper working order. NOT WORKING, FOR PARTS, OR AS-IS. We do our best to fairly evaluate the condition of a non-working item and give an honest description of any symptoms. If there are any further conditions, missing parts, or dead-issues with the item that are not described in this type of listing, Techno Empire will not be held liable for it. It does not cover such things as normal wear and tear. Incorrect voltage, un-authorized or self-repair, exposure to extreme temperatures, moisture damage, failure to follow manufacturers instructions or incorrect application etc. Loss from theft or loss from loss you like that one? It was stated above, but it is worth stating again. Techno Empire will not be responsible for the improper use or incorrect voltage applied to electronics. If an item we sell to you is not rated for the voltage of your country, it is your responsibility to get the correct voltage transformer to operate the item correctly. Otherwise damage could result, of which we will not be held responsible. We take your privacy and confidentiality seriously. We also accept all major credit cards. Please inquire for a special quote. Direct signature on packages is an option. Packages lost due to theft or loss are not the responsibility of Techno Empire Inc. Examine all boxes upon receipt by the carrier before acceptance. Carrier must note any damage to the box on a release form or you can refuse acceptance. Any items that you receive that have exterior damage to the box or damage to the item, or missing parts or accessories, please report this immediately to customer service at Techno Empire. Please keep all packing materials, accessories and merchandise tags for any item you want to report a claim. Please inquire for rates if you do not get a rate from the calculator. Techno Empire will not be responsible for any packages that are lost, stolen, or damaged in International transit. Regardless of any misrepresentations made or perceived to be made by Techno Empire. Return item must be repackaged for safe return with the same care and expertise in which you received it. Return items must be insured for at least the value of the item. When you receive the item, please don't tear into it like a heavily-caffeinated seven year old Edward Scissorhands on Christmas morning. Be mindful to open the package carefully using a sharp box cutter and observing not to tear up the sealed internal packaging also. For instance, if it is rack gear, we would recommend avoiding racking it until you were certain it was a "keeper". Thus preventing any possible "rack rash" or scratches. Although tempting, put down the extra sauce and cheese deep dish pizza that is dripping all over your leather vest and beard and be sure your hands are clean and dry before trying out your awesome new gear. Pet odors, cigarette and other smoke items can also affect the "newness" of your gear. Also, keep the gear away from your friend with the Billy Ray Cyrus mullet driving the Camaro. He's a good guy and he means well, but years of smoke tar and beer bongs have dulled his perceptions. So please use common sense and think in terms of preservation of the item until you are certain you are keeping it. We take lots of detailed photos so you can make the fairest evaluation of the item's physical condition using your own skilled observation; independent of our techs qualified, yet subjective, opinion. Incorrect voltage, self-repair, exposure to extreme temperatures, moisture damage, or incorrect application, etc. Earphones, microphones or other items that have intimate mouth, face or body contact. Software, computer hardware, computer drives and other digital or media tape. Items which are special orders, discontinued, close-outs, or "as-is" items are all non-returnable. HOW TO RETURN YOUR ITEM. The item "Siemens Telefunken V72 Microphone Preamp Modules with Direct Inputs 220V #25772" is in sale since Sunday, May 21, 2017. This item is in the category "Musical Instruments & Gear\Pro Audio Equipment\Preamps & Channel Strips".